According to Jacobelli, the Schola Armaturarum was built after AD 62 on the remains of an earlier building. 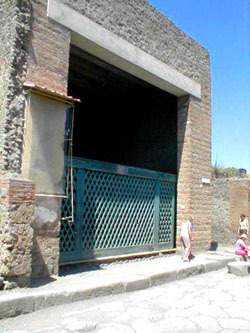 Della Corte thought it was a kind of school for Pompeii's youth, but Jacobelli claims that 'more recently it has been hypothesised that it was a depository of gladiatorial arms'. In the back room there was evidence that wooden cabinets had been fixed to the walls. These are thought to have contained weaponry - but in actual fact only a single ivory handle was found by the excavators. The walls behind the cabinets were painted with Winged Victories bearing weapons and shields - which is why the building is now connected to gladiators. The Schola Armaturarum was mainly excavated in 1915 by Vittorio Spinazzola. Its stunning facade frescos led him to partly excavate the building.